Congratulations to the Sweet Sixteen teams. The stakes only get bigger from here. Let's listen to the pros who lived it - on BCI Courtside Live! Please join us next Tuesday, March 28, from 9:00 - 10:00 pm ET, as pro players Milt Newton (Kansas, 1988 NCAA Championship team), Tyler Smith (Penn State, Sweet 16) and Ruben Boumtje-Boumtje, join moderator Peter Young to discuss both the practical and spiritual aspects of life in the pros, in front of a live internet audience at our BCI CSL4 3 event. Our upcoming CSL event will be seen on Facebook Live via BlueJeans Primetime. BlueJeans Primetime creates a powerful experience that engages, inspires and connects established communities on Facebook. Questions can be submitted by the viewing audience and answered by the pros - unscripted and in real time. If you missed our previous CSL events, watch them here. We want to thank Athletes in Action for partnering with us for this event. ...RSVP Now For An Opportunity To Win! RSVP and Win! We are pleased to announce an exciting drawing for this CSL event. ...and we will enter your name for the random drawing. 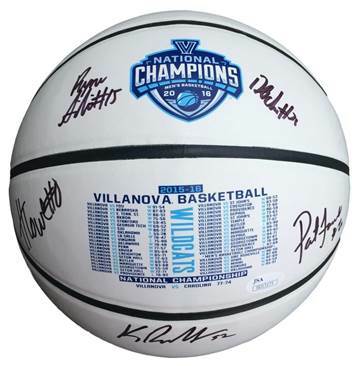 The winner will receive an autographed basketball from the 2017 NCAA Championship Team. Make sure that the right people know about this event, and the opportunity to win the autographed basketball. Share it with your friends and family on Facebook, Twitter and Instagram. So many things compete for our attention today. Watch this. Do that. Buy this. Listen to this. How can we separate the message-worthy conversation from the empty chatter? Start by looking at the source. Quality source, quality message. I see all-access, conversational events like BCI Courtside Live providing value as one way to break through the chatter and truly add to a global conversation. After all...a message is only as good as its source. Looking forward to seeing you next Tuesday evening. Im personally inviting you to play the game with us! Download the free Fire Fan App from either the App or Google Play store using our rewards code Sharm46 for free tokens. It's real-time play that puts your head in the game..literally..while you're watching the Game! Thank you for your support of BCI. BCI Loop and our youth outreach intiatives depend on the generous support of individuals like you. To make a contribution, please visit BCIEdge.org.